1. Mix applesauce and cinnamon together well 1st with a wooden spoon and then form a dough ball with your hands. 2. Using a quarter of the dough at a time, flatten the dough to a thickness of about 1/4 inch using a rolling pin onto a pastry sheet or wax paper. 3. Use heart cookie cutters and a drinking straw to punch a small hole in the top of each ornament to hang them. Keep them flat and move them to a warm, dry spot for 3 days to allow them to dry. Turn each ornament over to dry on the other side for 3 more days. 4. 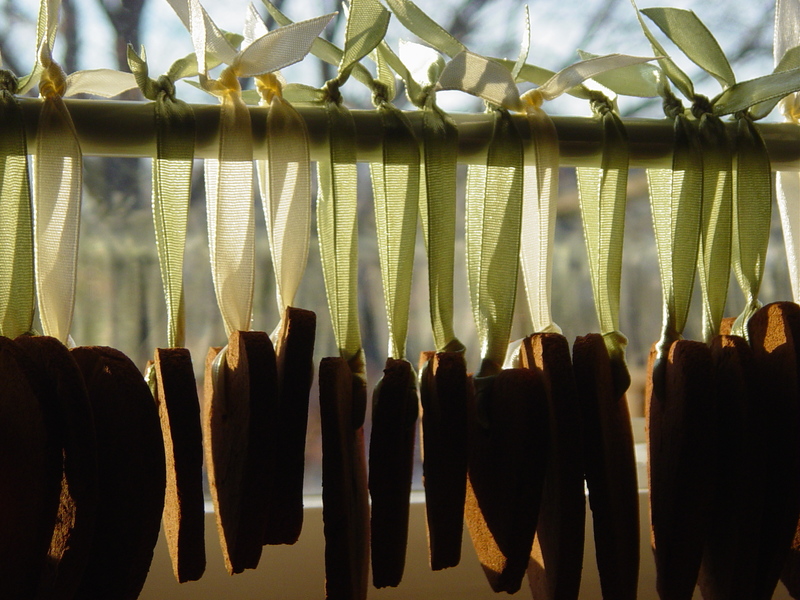 After about a week of drying flat, put a ribbon through each heart and hang on a suspension rod in a window. After about 2 more weeks of drying, the hearts should be ready. Put your hearts into a box gently and cover until needed for a shower gift, a Valentine’s Day gift or a gift for no reason at all. 5. ENJOY – A snift of a cinnamon heart a day, will keep the blues at bay! I made these hearts as favors for my daughter’s wedding shower. The idea came to me because I have been staring at a cinnamon heart on my window in my kitchen for the past 15 years. My children and I made them one year to put on top of everyone’s Christmas presents. The scent lasts a very long time and the heart is pretty to look at. This recipe is really a craft that can be made in advance to save you time during a busy party or holiday season. These cinnamon hearts can be enjoyed for many years to come, something you can tell by how long I have kept mine!